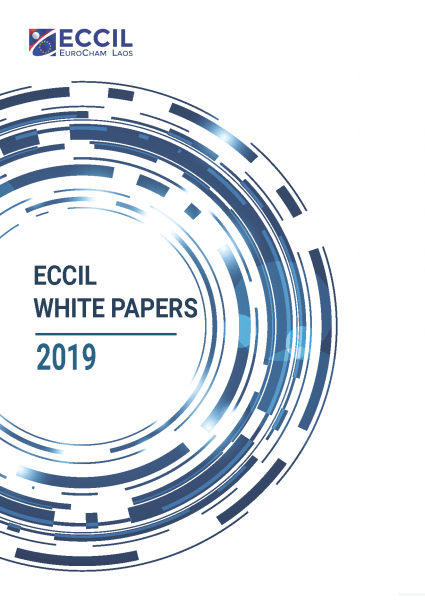 Home News The ECCIL White Papers 2019 is now available! Welcome all readers to the European Chamber of Commerce and Industry (ECCIL) 2019 White Book. This is to follow up on the success of our first White Book last year, the first White Book ever produced by a Chamber of Commerce in the Lao PDR. In keeping with our role as a European Chamber of Commerce, the White Book is just one among a number of ways in which we share our thoughts on critical issues that can help Laos become a more attractive place for European companies to invest and Europeans to work. Thanks to the Government of Laos, ECCIL has had a number of opportunities to discuss a variety of topics over the past year. ECCIL was invited to contribute feedback on draft laws and contribute to a number of workshops, including one at the Prime Minister’s Office. ← Register now for the Top Executive Meeting 2019!